It's time for la vendemmia! All over Italy, grapes are being harvested and transformed into many kinds of vino italiano. Lately I've been hearing from my friend Massimo about the vendemmia that is taking place near his home of Bologna. First Massimo told me about a food festival that he and his family (wife Sofia and daughter Erika) came across one Sunday afternoon in Bologna's centro storico. There were many booths selling fall fruits, vegetables, jams and wine, among other things. 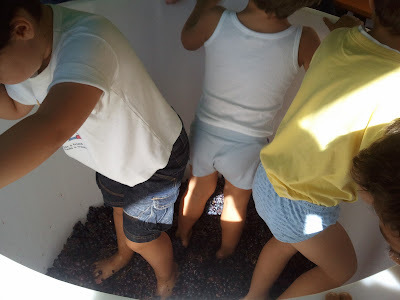 They also came across a booth where children were allowed to jump in a vat and stomp grapes, the way wine making was done many years ago. Massimo's family was also invited to attend la vendemmia at his friend Fabiano's house in the country, where a machine called il torchio (winepress) is used to squeeze the grapes. Il torchio has been in existence in one form or another for many years, so la pigiatura dell'uva (grape stomping) nowadays in Italy is done mostly for fun. Massimo sent me a few photos of the wine making process that went on at Fabiano's house. The end result: vino Moscato (Moscato wine) for family and friends. Sofia preme l'uva sotto gli occhi attenti del padre di Fabiano. Grazie mille a Massimo per le foto e la famiglia di Fabiano per la vendemmia! Many thanks to Massimo for sharing his weekend outing at Fabiano's! Massimo also sent me a link to a High Definition video he created and posted on YouTube about the wine-making. It's fabulous! Cold fusion - a breakthrough in Bologna?